Extracts of algae, pepper, ginger, essential oils of rosemary and lavender as well as invigorating camphor promote a pleasant feeling of warmth for cold feet. Aloe Vera, Urea and Glycerin improve skin moisture in a base of skin-friendly emollients such as avocado oil, beeswax and lanolin. The result is strengthened skin with an improved moisture barrier and a smooth, supple appearance. 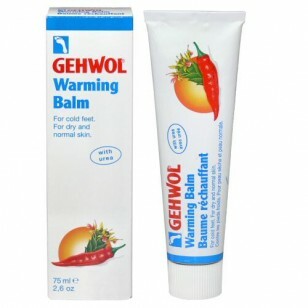 Tip: You can increase the warming effect by treating feet to a tepid GEHWOL Foot Bath beforehand.